Cooking a plate of ‘premium taste’ pasta at home is actually very easy and much cheaper. 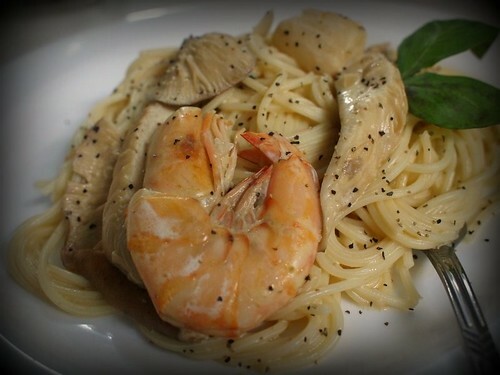 Moreover, not many restaurants can get their pasta right because they either cut cost by using cheap ingredients or some are halal joints and didn’t use white wine which give the pasta the ‘luxurious flavour’. Good pasta does not require much ingredients. 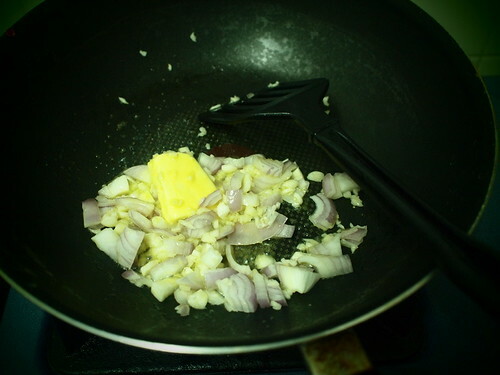 The basics are garlic, onion, basil, olive oil and salt and pepper to taste. 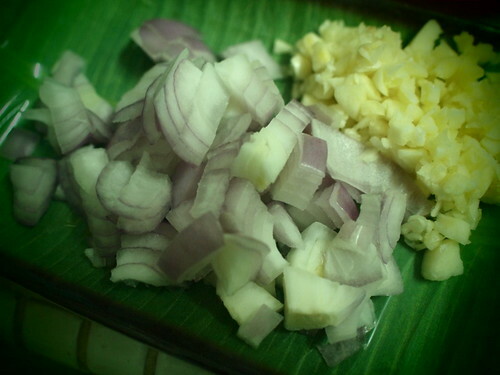 For the creamy pasta I am cooking, I use chopped onion and garlic. BTW, garlic price has skyrocketed like 200%. 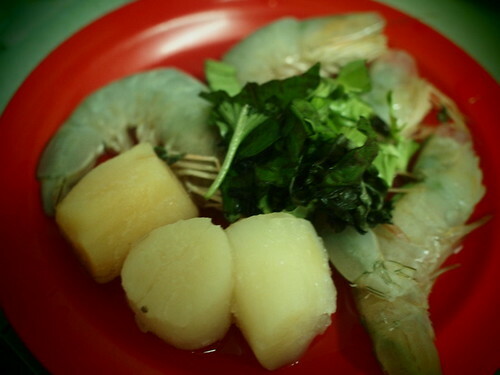 I bought 3 bulbs of garlic for RM2 when usually, I can for only 50 sen.
For the seafoods, I use some very fresh white prawns and frozen scallops. I added a few leaves of sweet basil to the seafoods for flavour. 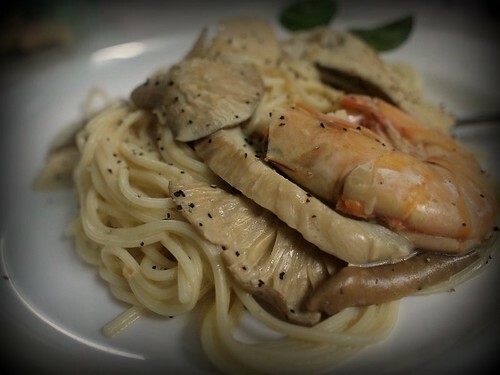 Since I have some abalone mushrooms, I use them. 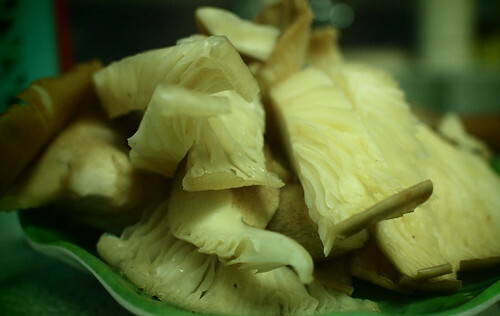 However, a better choice will be either button or fresh shitake mushrooms as these mushrooms will lend more flavour. To get that creamy taste, butter will be a good choice. You can substitute with olive oil which is a much healthier choice but what’s a bit of butter, right? My hubby bought some 5-minute quick cooking spaghetti which is rather mushy. 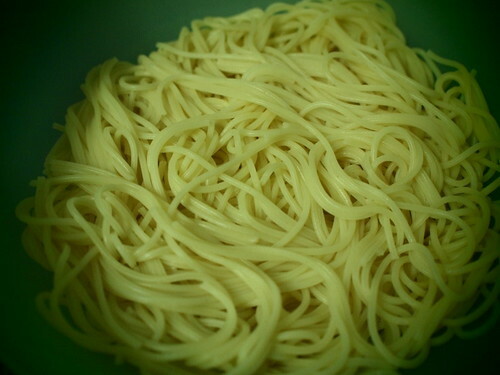 If you are boiling spaghetti, remember to keep testing and tasting to make sure that you get the al dente texture. See? Just a few steps. And you get a really nice plate of pasta. Cooking pasta just take a bit of practice. Once you have tried a couple of times, you can experiment with any ingredients.